UConn takes on Kentucky in the NCAA men's basketball championship in Arlington, Texas. Stay up with Boston.com as we provide our skewed view of the action. Shabazz Napier just goes on a quick little rant. Napier was also named the Final Four's Most Outstanding Player. UConn is the 1st team to win the national title despite not playing in any postseason tournament the previous season since NC State in 1974. 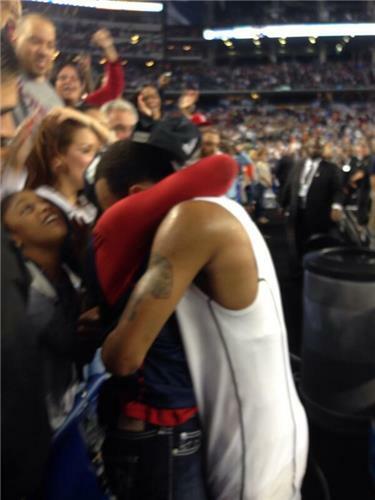 Shabazz Napier: "This is what happens when you ban us." Cauley-Stein says he hasn't decided on NBA but he loved UK and part of him thinks "Why not stay until they make me leave?" Lotta tears in that locker room. All say now isn't the time to think about their NBA decisions. Ollie "it feels great. They've been amazing, resilient the whole year"
WCS wanted it to end "up on the stage, swinging our shirts,wearing our hats backwards, taking goofy pictures that'll be with us forever." Boatright. "my ankle? It was hurting. But w 9 minutes to go I wasn't going to let an ankle sprain keep me from fighting w my brothers"
Napier "when we lost to Louisville I told everybody to pick ur head up. We're going to be team holding up that trophy. It surreal were here"
I got my Husky pride on tonight. Bow wow wow!! Now go get some Irish, Husky Ladies!! !